The fun-first inflatable board that’s easy to ride, beautiful to look at, and built with the latest technology. The Tikhine Series inflatables are a great board for first-time paddlers, SUP Yoga, and those that want an easily accessible way to paddle just about anywhere. The new fun first Tihine series boards with artwork designed by the World Champion paddle boarder Sonni Hönscheid. For 2019, Starboard has upped the game with new innovative technology by introducing welded seams to their inflatable Tikhine lineup. The new welded seams create a complete airtight seam that is longer lasting and better for the environment. The integrated paddle holder helps keep track of your paddle while you are working on your yoga moves and integrated deck tie-downs allow you to bring what you need for a day on the water. The EVA deck pad is easy on your skin and insures traction on your board during your fitness and paddling session. 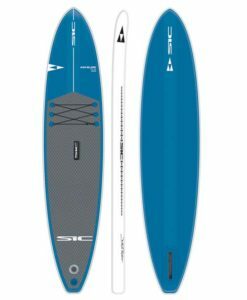 The Tikhine Inflatable SUP is a great choice if you need a board that takes up minimal space and that fits inside your car for easy transportation to paddle just about anywhere. The design with a straight outline, keeping it slim and simple making an efficient well tracking inflatable, encouraging more correct paddle technique. The wide tail will give you plenty of stability from the wide tail for SUP Yoga. Tail carry handle can be converted to a paddle holder, one of many Starboard innovations. 11’2″ x 32″ Tikhine Zen Inflatable This great shape blends nice glide with good stability. Suitable for day trips, yoga sessions and fitness workouts. The increased waterline and higher volume makes the 11’2″ x 32″ a top Tikhine choice for riders 100 to 220 lbs. Leashes Save lives – Includes free lightweight Starboard leash. 10’2″ x 31″ Tikhine Zen Inflatable This fun compact board’s wide tail makes it easy to step back and make quick fun turns. The glide sensation of the very light hull makes it a top choice for riders 90 to 200 lbs. Leashes Save Lives – Includes free lightweight Starboard leash.